Dip and appetizer season is among us and I couldn’t be more happy about that! They are both mine and my hubby’s favorite thing to chow down on. My husband particularly loves a good dip recipe and today’s recipe is just that! 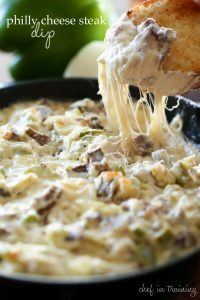 This Philly Cheese Steak Dip is phenomenal and truly tastes JUST like you are biting into that beloved and well sought-after sandwich. The flavor is incredible and this recipe is super unique and exciting! 0 Response to "Philly Cheese Steak Dip"